Chichagof Island has been named “Bear Island” by National Geographic because it has the highest concentration of bears in the world at 1-2 brown bears per square mile. This Exclusive Wildlife and Bear Search small group tour will give you a flexible, up-close experience that the large group tours simply cannot offer. 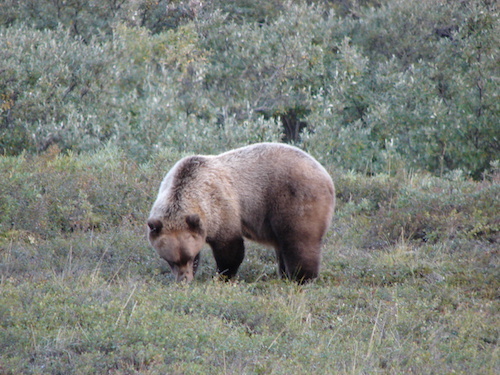 There are many exciting things to see, such as a the scenic view of a muskeg, some of the ten varieties of edible berries found on the island, viewing an old growth forest, and potential sightings of the king of the island: brown bears. Based on current bear movements, feeding habits, and daytime temperatures, there are short stops in key locations to scope out a magnificent view of these captivating creatures — and your wildlife guide knows them all! They will also share information about the area and the Tlingit Native population. There is also a host of other wildlife that are quite frequently spotted during excursions, including mink, marten, red squirrels, otter, beaver, ducks, sea birds, Sitka black-tail deer, and plenty of bald eagles. So be sure to bring your camera. NOTE: The departure time for this tour is 30 minutes past the cruise ship arrival. Please check your ship's itinerary and select the appropriate time. Please note, wildlife sightings can never be guaranteed.